Rules of thumb can be great. They allow us to take complex topics and make them simple. For example, you’ve probably heard that you should change the oil in your car every 3,000 miles. We don’t need to understand much about cars to follow this rule. Simply read the little sticker Jiffy Lube puts in the window and take the car in when required. Following this rule of thumb helps us to believe we’ve protected ourselves and our vehicle from the bad things that would happen if we didn’t get the oil changed. However, there are a couple potential problems with rules of thumb. First, they rely on everyone’s situation being the same. There are many types of cars and many types of drivers. Does it really make sense that they all require identical treatment?Second, over time some of the underlying assumptions that led to a rule can change. Car engines and oil have both evolved substantially over the years. While it may be great for your mechanic to have you continue to change your oil every 3,000 miles, most car manufacturers now recommend substantially higher distances between oil changes. So, what does any of this have to do with retirement planning? Well, let me explain. 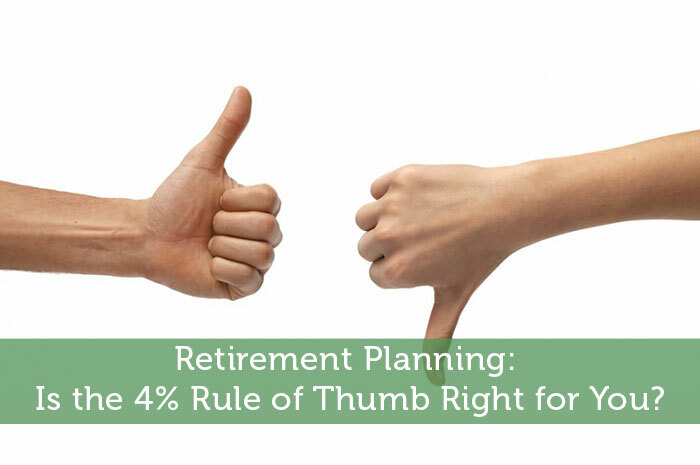 One of the most common rules of thumb in retirement planning is called the 4% rule. It was designed by a California financial planner in the 1990′s named William Bengen, and the simple idea is to help you figure out how big a portfolio you need for retirement. You start by figuring out how much you want to spend in your first year of retirement and then multiply that number by 25. The assumption is if you do this, you can withdraw 4% of your money in that first year of retirement, adjust it by 3% each year for inflation and that you will be very unlikely to outlive your money. The 4% formula relies on rates of return higher than many experts believe are realistic in today’s environment. It also has a single static asset allocation for everyone. It assumes you will spend a consistent amount from year to year and that we all have very similar spending habits and patterns. Have you paid off the mortgage? Do you plan to support your adult kids? Do you want to travel the world, or be a joyful homebody working on your garden all day? Whatever your personal goals and situation are, they’re probably a little different from most other people’s, which means your spending requirements probably are too. Bengen’s original 4% model was based on a 25-30 year retirement period. Depending on when you plan to retire and your assumptions about your own life expectancy (which has been increasing for most of us) this might not work for you. Black swan events are random or unexpected events that deviate beyond what is normally expected of a situation. They can and do happen, but they are extremely difficult to predict. What happens in your first several years of retirement greatly impacts whether the 4% rule works. If you experience a black swan event (such as a bear market, the dot-com bubble of 2001, or the housing crash of 2008) in your first couple years of retirement, your odds for success with the 4% rule drop precipitously. I could go on, but I suspect you get the idea. While the 4% rule can give you a ballpark idea of where you need to be, working with a financial advisor can help you understand your unique needs and goals so you can come up with a financial plan that works for you. Wealthminder helps you quickly find and connect with licensed financial advisors that suit you through our proposal request tool. Get started today. Retirement Planning: Is the 4% Rule of Thumb Right for You? Well maybe with interesting rates finally starting to increase, we can get more on our retirement saving. This will help us out on the 4% rule, so that we can withdraw interest earned without cutting into our principal. @wealthminder. Very well written and articulated piece. My perspective is more negative! The 4% Rule came from an era of much higher interest rates that allowed for CDs and money market returns to finance many retirements. You point out that with rates and returns lower, this may not work. I run a large wealth management and private banking business in my day job and the reality is the implied risk you need to assume these days is just too high. the world has changed. Thumbs down from me on this historic relic!